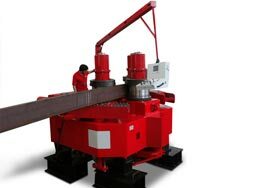 Bending machines for profile, beams and pipes must be extremely resistant. 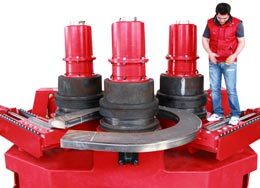 DAVI angle roll are made to work in the worst load conditions, assuring the best performances even for intensive production. DAVI decided to design the angle roll with sturdy welded structure. The shafts are supported not only by the front frame but also by the inner frame, in order to balance the loads applied during the bending process, to avoid deflection that will affect the final result. All three rolls are driven by hydraulic motors with gear reduction units fitted to each shaft, assuring the highest torque to feed the profiles while bending. The machines are supplied with modular dies that can be adjusted to fit any size profile or beam. Only pipes require specific set of dies for any single diameter. To bend HEA, IPN, UPN or IPE, a special traction tool and special dies can be provided to avoid the webb distortion, obtaining the desired radius maintaining the beam correct position. Two hydraulic guide rolls are fitted on both sides of the machine as standard equipment. These guides can be moved in 3D from the operator panel, to facilitate the correct positioning of the profile during the bending. It’s particularly useful to bend Angles, flat and UPN. The guide rolls are particularly useful to bend pipes to create spirals, as allows controlling the pitch. The angle roll are made to be highly resistant, have large diameters shafts that guarantee the highest quality of the finished product. Furthermore, the DAVI angle roll takes advantage of the modern technology represented by the modern DAVI CNC control.